In May 2010, temperature records assembled by the NASA Goddard Institute for Space Studies (GISS) showed wide expanses of slightly above- and slightly below-normal temperatures over most of the globe, but also dramatic warmth near the North Pole. Cooler-than-normal conditions occurred in parts of western North America, southern South America, Western Europe, and Central Asia. Unusually low temperatures also affected parts of Antarctica, especially west of the Antarctic Peninsula. Over much of the globe, however, high temperatures predominated. 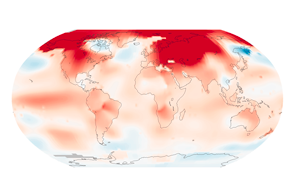 This color-coded map shows global surface temperature anomalies for May 2010 compared to average temperatures for the same time of year from 1951 to 1980. Above-normal temperatures appear in shades of red, and below-normal temperatures appear in shades of blue. Gray areas indicate areas of insufficient data. Especially warm temperatures—close to five degrees Celsius (9 degrees Fahrenheit) above average—occur over most of the Arctic, including the northernmost reaches of North America, northwestern Greenland, and most of the northern coast of Eurasia. Unusually warm conditions also extend southward into Eastern Europe and Siberia. In Antarctica, warm conditions appear in some inland areas and especially over the Antarctic Peninsula. Temperature anomalies in May continued a much longer trend. GISS compared the January–May mean surface temperature anomalies for 2010 to those of 2005 and 1998 (the two warmest years on record). January–May anomalies show 2010 to be the warmest out of 131 years (2005 is the fourth warmest and 1998 is the fifth warmest). Moreover, Arctic temperature anomalies are especially pronounced, and have been since the turn of the twenty-first century. 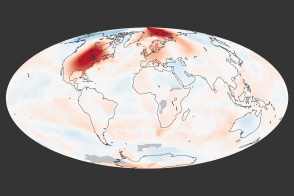 “Ongoing temperature anomalies like these are strong evidence of the Arctic amplification of global climate change,” says Ted Scambos, lead scientist at the National Snow and Ice Data Center. The Arctic environment is very vulnerable to warming because of feedbacks that amplify the initial change. Sea ice retreat and snow melt reduce Earth’s albedo, which can lead to increased warmth and further melting. Scambos explains that, although the Northern Hemisphere experienced significant snowfall in early 2010, spring melt was rapid, exposing land surfaces to sunlight sooner than usual. NASA image by Robert Simmon, based on GISS surface temperature analysis data including ship and buoy data from the Hadley Centre. Caption by Michon Scott. 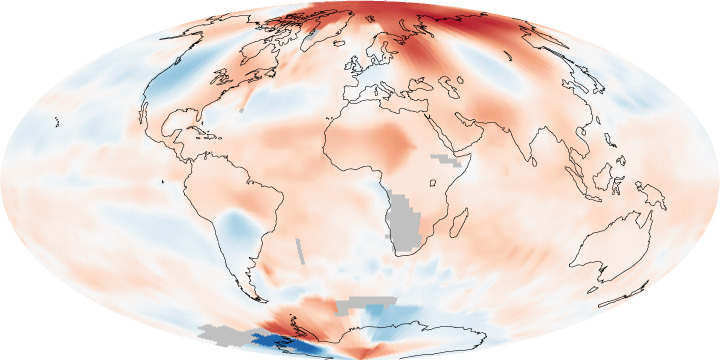 This color-coded map shows global temperatures for May 2010. Although cool conditions prevailed in some heavily populated areas, warm conditions predominated, especially near the poles. NASA Goddard Institute for Space Studies. (2010, June 11). January–May Mean Surface Temperature Anomaly. Accessed June 24, 2010. Serreze, M. C., Barrett, A. P., Stroeve, J. C., Kindig, D. N., and Holland, M. M. (2009). The emergence of surface-based Arctic amplification. The Cryosphere, 3, 11–19.